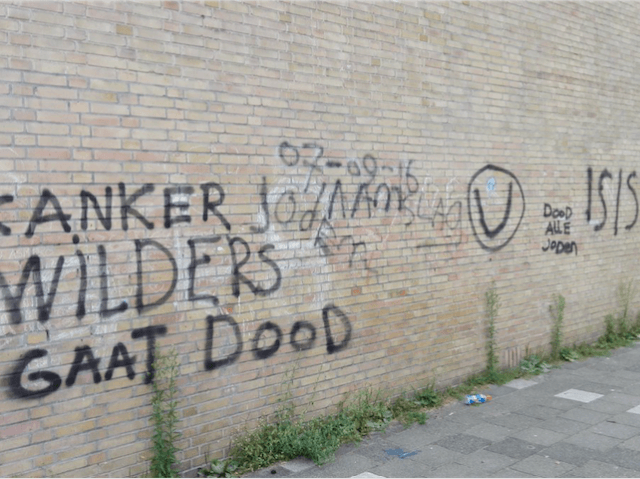 A small urban district in the Netherlands has been coated in threatening graffiti, declaring allegiance to Islamic State terrorists and promising Jews and right-wing politicians will be killed. At least five cars, twenty private houses, a school and a commercial building in Voorburgse near The Hague were vandalised in the systematic attack. The scrawling read: “Kill all Jews”, “Cancer [Geert] Wielders is gonna die”, “7th September 2016 attack Jews”, and, “Jews gonna die”. Mr. Wilders is the founder and leader of the right-wing Dutch Party for Freedom, a prominent member of the Dutch House of Representatives and an outspoken campaigner against radical Islam. “We do not think that it is a targeted action “, a police spokesman told Dutch news site AD. “This needs to be cleaned quickly”, he added. Some of the most explicit and violent texts was written on a primary school, attending by children as young as five. “As a parent of two students I am shocked, these are things you do not want to see. This is heating up and desperate people are supporting Islamic State and these are the symptoms”, one mother told the publication. More than 6 per cent of the Netherlands is now Muslim and the nation has sent hundreds of Islamist recruits to Syria. Mr. Wielder’s uncompromising rhetoric has made him a target before. In 2010 he was put on an Al-Qaeda hit list, and in an internet chat room that year Australian Islamic fundamentalist preacher Feiz Mohammad urged his followers to behead Mr. Wilders.